Atomhawk is proud to have worked with Funcom on their new game, Conan Exiles, providing user interface design for the rich features of this unique survival game. We helped to create an easy to understand inventory management and crafting system that supports the huge numbers of collectable and craftable items in the game. Among the many screens Atomhawk worked on for Conan, the character creator portion is one which uses a distinct visual style with swathes of blood staining the left of the screen adding the perfect barbaric backdrop to the game’s brutal opening scenes. A good user interface clearly communicates all the information a player might need and gives them the power to achieve their goals - in order to quickly iterate on the interface design and create an intuitive layout Atomhawk produces wireframe designs. These wireframes help demonstrate the effectiveness of the interface before committing time and effort to building it. Atomhawk often work on wireframes and visual design in parallel, allowing our clients time to rapidly and effectively iterate on both aspects before combining them for the final result. The visual design of a UI system is as important as the functionality and ease of use. Atomhawk worked with Funcom to create a visual style that fits the themes and motifs of the game world, providing them with game-ready assets for implementation. 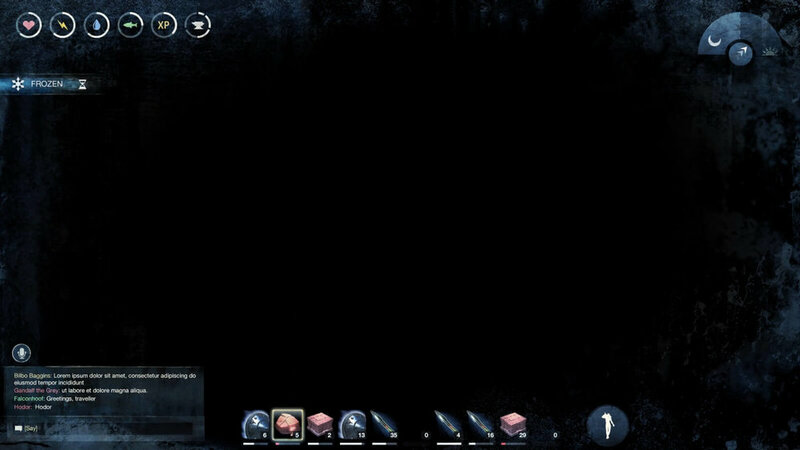 The HUD is an important piece of the game's moment to moment play, providing users with essential survival information and quick access to their most needed inventory items. Here, the HUD has been designed to provide a broad overview of essential information in an unobtrusive way - more specific detail on all of the statistics shown can be found in the main UI.